FLORENCE, Ala. – A fifth year of grant funding for the University of North Alabama should help students and teachers in the state continue improvements in their understanding of math. 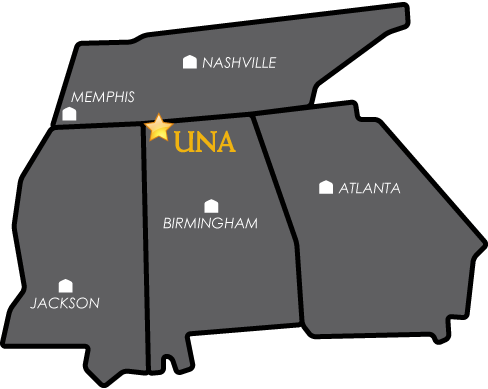 UNA’s Collaborative Partnership to teach mathematical Reasoning through Computer Programming (CPR^2) was recently awarded $211,317, which will allow for continuation of the program. While the grant is awarded through the Alabama State Department of Education, the funds ultimately come from the U.S. Department of Education Math and Science partnership. The CPR^2 program was developed by UNA math and computer science professors Cindy Stenger, Janet Jenkins, Jessica Stovall and James Jerkins, and is designed to support high school and middle school mathematics teachers. Dr. Cindy Stenger, chair of the math department, said the idea for the CPR^2 project and grant started about five years ago. Stenger said the whole idea was to develop an explicit method to teach abstraction and for that they needed to include aspects of computer science. Stenger and Dr. James Jerkins said the team used computer programming to build the mental frameworks for abstraction. They were then able to develop a method that they said has been extremely successful at teaching instructors and students to start writing general expressions for mathematical concepts, and then using those expressions in logical arguments and speaking in more abstract terms, which they both said is an imperative skill when it comes to working in the STEM fields. Jerkins said the benefit of students using the computer to learn these concepts is twofold. For one, students are more apt to participate if they can play with the computer; and, two, students get the opportunity to experience some simple coding and are introduced to that computer science. And that’s important, because according to both professors, computer science and mathematics are deeply interconnected! “A big part of our program is building a collaborative relationship with the regional high schools and middle schools, and we’ve even started some work with elementary schools,” said Jerkins. “But the key is we’re building this partnership so that together we can address this issue, and we’re also visiting their classrooms,” he said. Over the past four years more than 600 students and 190 teachers have participated in the CPR^2 program at UNA.